Slieve Meelbeg is usually considered to be the twin of the adjacent Slieve Meelmore, the higher of the two despite what might be inferred from the name. It is a steep-sided but relatively unremarkable hill with little in the way of crags, and the Mourne Wall continues its course over the summit. Ascents will generally be made from the Trassey Road from the north and west. The most commonly used ascent is via the Trassey Track itself, starting from the road near the substantial car park at (311315 A), following the track up to the dramatic col between Slieves Bearnagh and Meelmore. From here the summit is gained either by following the Mourne Wall over Meelmore, or by following a track contouring under the south side of that mountain to the col between it and Meelbeg, following the Mourne Wall up from there. In addition, the Ott Track can be followed from (280279 C) to the col between Carn Mountain and Slieve Loughshannagh; from here the Mourne Wall leads over the latter's summit and up onto Meelbeg itself. A further approach is possible from the other side, making one's way from the Silent Valley up to the Ben Crom Dam, crossing the dam and then following the path under Ben Crom into the valley of the Ben Crom River. A sometimes boggy path leads up this stream to the foot of Meelbeg, and a steep and pathless but otherwise straightforward climb then gains the summit. 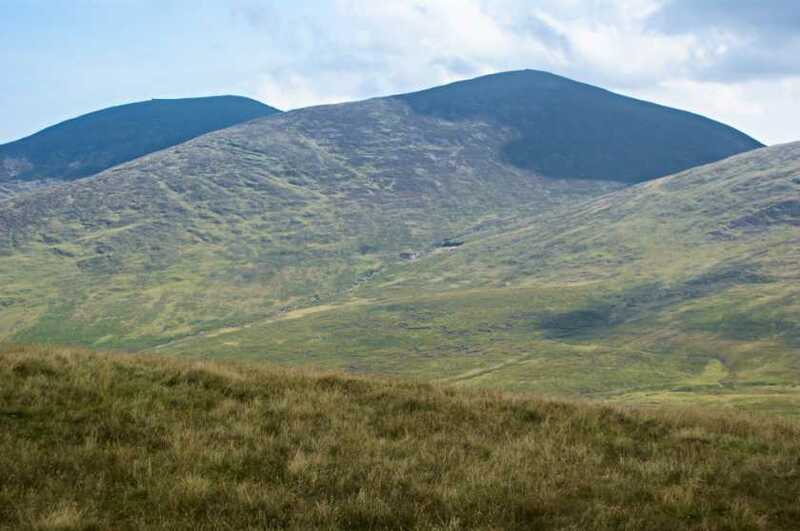 (This route from the dam is crucial during the Mourne Seven Sevens challenge walk).